* No purchase necessary. Open to residents of Canada over the age of majority. Contest is open from 1 January 2019 (12:00:01 AM ET) until 30 April 2019 (11:59:59 PM ET). Prize includes: (i) round trip airfare (economy class) for the confirmed winner and his/her Guest to the Host City from a Canadian airport near the confirmed winner's residence (all as determined by Sponsor in its sole and absolute discretion); (ii) transportation (via a means determined by the Sponsor in its sole and absolute discretion) for the confirmed winner and his/her Guest from the airport in the Host City to the hotel in the Host City; (iii) accommodation for two (2) (double occupancy) for two (2) nights in a hotel or hotels determined by Sponsor in its sole and absolute discretion; (vi) transportation (via a means determined by the Sponsor in its sole and absolute discretion) for the confirmed winner and his/her Guest from the hotel in the Host City to the airport in the Host City; (v) two (2) general admission tickets to attend one (1) Stanley Cup® Final Game (game and seat selection at Sponsor’s sole discretion – subject to availability); and (vi) $500 CAD spending money for the confirmed winner. The Prize has a total approximate retail value of $4800 CAD based on a Toronto departure and Chicago Host City example - the actual retail value will vary depending on the point of departure and Host City. Limit of one entry per person. Winner will be randomly selected from all eligible entries and odds of winning depend on number of eligible entries received. Skill test applies. 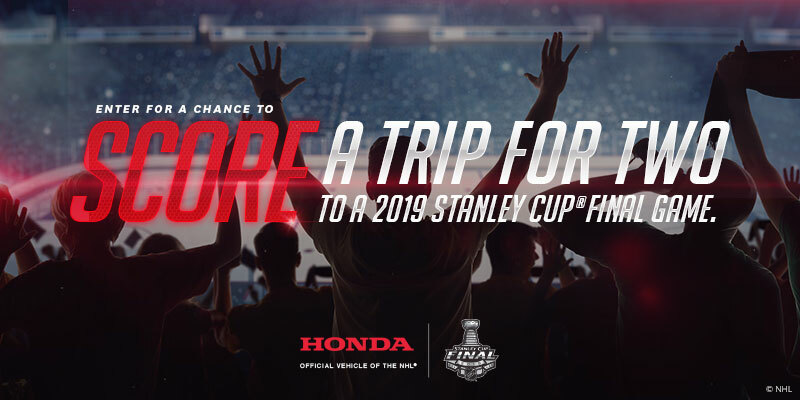 Official Contest Rules available at www.honda.ca/HondaStanleyCupContest/rules. NHL and the NHL Shield are registered trademarks of the National Hockey League. ©NHL 2019. All Rights Reserved. I consent to receive commercial electronic messages including news, advertisements and other promotional information from Honda Canada Inc. (Honda) and Honda Canada Finance Inc. (HCFI), including their dealers and respective agents. I can unsubscribe or withdraw my consent at any time using the unsubscribe method provided in the communication, by contacting Honda or HCFI at 180 Honda Boulevard, Markham, Ontario, L6C 0H9, or by telephone at 1-888-946-6329 (Honda) or 1-800-387-5399 (HCFI). If I do not check this box but have previously provided express consent, my communication preferences will remain the same unless I unsubscribe. Yes, share my information with the NHL, its Member Clubs and Business Partners, so they may send me news, offers and other info about the NHL, its Member Clubs and Business Partners.